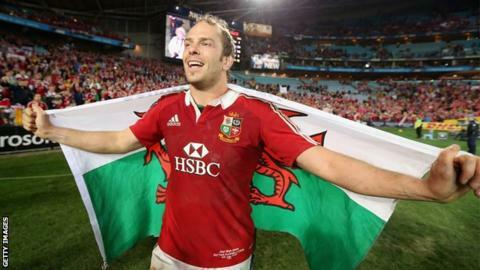 Legendary British and Irish and Lions scrum-half Sir Gareth Edwards says Wales captain Alun Wyn Jones will be high on the list of potential captains for the 2017 New Zealand tour. The captain for the tour has yet to be decided by coach Warren Gatland. "You need a captain who can virtually guarantee his place, the obvious names are Alun Wyn Jones of course," he said. "I'm a great fan of his, and [Ireland's] Rory Best, these are the guys who stand out." Edwards said he would not rule out Sam Warburton despite losing the Wales leadership role to Jones, but believes England captain Dylan Hartley's chances will depend on their Six Nations success. Both Warburton and Jones took the captaincy during the victorious 2013 Lions tour of Australia, with and Jones taking over for the final Test after Warburton missed out through injury. "There's lots of competition for lots of places and back row is one of them, though I would still have Sam Warburton in my side," Edwards told BBC Wales Sport. "I don't think the fact he's not [Wales] captain at the moment would detract from him being selected as a Lions captain because he's got a track record, he's been there and done it." Edwards, who was part of winning tours to New Zealand in 1971 and South Africa in 1974, is a believer in experience for the Lions. "People like [Ireland lock and captain] Willie-John McBride in my day benefitted greatly from being on other tours and he was an outstanding captain," he said. So will Jones' chances of captaincy be boosted by the fact that he is more widely seen as a likely first choice in the team? "I'm expecting Maro Itoje to take New Zealand by storm but yes, Alun Wyn Jones, the way he's been playing, certainly has got his hand up," Edwards said. "It's not over till it's over, so Dylan Hartley without question, as captain of a successful England side if they win the Grand Slam, might be an automatic choice because there will be a great deal of English players in the squad." Edwards believes that Ireland's Conor Murray, a previous Test Lion, and Wales's Rhys Webb will be leading the race to claim his old number nine shirt. "I still think Conor Murray is one of the leading candidates although Rhys Webb has really been coming up," he added. "We've got good scrum-halves, even Danny Care coming on for ten minutes [for England] can shake people up although Ben Youngs is in the ascendancy and is their number one. "Conor Murray has shown a lot of maturity and he looks calm, cool and collected, but Rhys Webb has shown that he's quite capable of getting in there."